My younger sis sent me the link to this recipe in August of 2007 and I finally just tried it. It is amazing! I have made some adaptations to the original recipe - mainly the way that I baked it. I also added a topping. Preheat the oven to 350. Grease a 10 inch springform pan with butter.I also cut out a circle of parchment paper to fit into the pan to make it easier to remove the cheesecake. Stir together butter, sugar, and vanilla in large bowl with spoon or wire whisk. Add the eggs, stir until well blended. Stir in flour, cocoa, baking powder, and salt; blend well. Bake 25 to 30 minutes or until brownie begins to pull away from side of the pan. Meanwhile make the cheesecake layer (directions below). Immediately after removing brownie from the oven, sprinkle milk chocolate chips, peanut butter chips, and peanut butter cups over the brownie surface. Spoon the cheesecake mixture over the chips. Turn down the oven to 325 degrees. Add the sugar, peanut butter, and cream. Mix until smooth. Stir in the Peanut Butter Cup pieces. Place the springform pan on a baking sheet and return to the oven. Bake for 65 minutes or until the center is almost set. Pour over the chocolate. Whisk until smooth. Pour the chocolate on top of the cheesecake. Drizzle the melted peanut butter chips across the chocolate topping. Place the Peanut Butter Cup pieces around the edge of the melted chocolate. 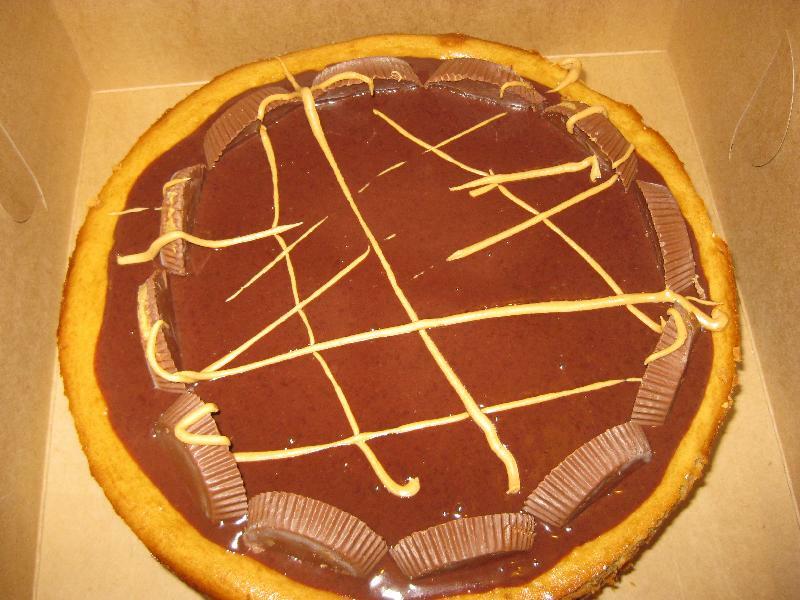 Description: If you love Peanut Butter Cups and cheesecake you must try this!